Here are the facts. If you've been searching for wildfire protection and don't know what to choose, try our comparison charts below. Not all products on the market are the same. 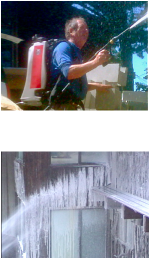 We are here to help you see why fire protection foam is the best product on the market that suits your needs. Our grid below will show why Foam is the best product for protecting a structure. See how the Los Angeles Fire Department tested foam on a structure to prove its capabilities HERE. Below are the basic facts of the three leading fire pretreating products on the market today. For a direct comparison of how our products compare to others on the market, click HERE. Gels can only be applied by hand and may harm your plants. Some are non-toxic and safe to use. However, these gels dry and solidify onto your structures and can be very difficult and expensive to clean up. While effective as a fire barrier, some can discolor or stain your structure and actually peel off the paint when removed. They are only affective when in a wet state, which usually lasts 4-6 hours after applied and are completely useless once hardened and dry. If you don't have complete coverage (100%) on all surfaces, gels are useless as the exposed area can catch fire and burn right through a structure. The gel is very slippery and dangerous for you and firefighters when not cleaned off walkways or other surfaces that are walked on. They have a short shelf life (about 3 years) and must be shook before being used. Fire Retardant can be applied by hand or automatically. Be aware that it harms your plants by burning them and it can take up to a year or more for them to recover. Also high in phosphorus it is harmful to the environment and water inhabitants. Can not be used to protect your home only used on vegetation to create a fire break and dries to a dust, which is difficult and dangerous to clean up. Recommended clean up is removing dust in a dry state, not to wash it into the sewers, and do not use a bleach based product to clean up as it may cause and explosion! Fire Retardant becomes useless once water touches it, and washes away. The long term claims are only correct if there is no rain or water to the area sprayed. With the fire retardant used in neighborhoods being clear in color, you really have no idea if it has been applied, where it is, and what it is on. The U.S. Forest Service has recent lost a lawsuit with the EPA, and has decided to discontinue 30% of the areas it is commonly used in fighting wildfires in the forest. This is due to the harm it does to the environment. Do I want to apply the fire protection product myself before I evacuate? Will I stay to fight the fire? Do I want a system that sprays my home and/or my landscape and vegetation? Do I want a fully automatic wildfire protection system or one that I activate? How will the product will effect my property and the enviroment? What part of my property do I want to protect - all or some? My home only, or am I concerned about my landscape and surrounding vegetation and outbuildings? What will the clean up process be? What is the shelf life of the product - how long will it keep? Is the product safe for my pets, my home, and my family? What are the associated costs with using each product, including clean up after use? Do I want to be involved in choosing the product or do I want help in choosing the best product for my needs?